The play of Michael Grabner, Kevin Hayes and J.T. Miller are the biggest reason for the Rangers’ success this season. That continued in a 4-3 win over Nashville Thursday night at MSG. AP Photo via Getty Images courtesy NYRangers. What if I told you before the season that it wouldn’t be Henrik Lundqvist or Ryan McDonagh carrying this team? What if I said it wouldn’t be Derek Stepan or Rick Nash? What if we concluded that it would be Jeff Gorton’s brilliant free agent addition Michael Grabner, who is leading the Rangers in goals getting his 26th while cohesive linemates Kevin Hayes and J.T. Miller continued the third line’s dominance in a 4-3 home win over the Predators? Through 54 games of an 82-game schedule, it’s the unreal chemistry between Grabner, Hayes and Miller that has this team where it is in the standings. In what’s been by far the most competitive division, the Rangers still sit fourth in the Metro with 71 points. They’ve pulled to within two of suddenly inconsistent Columbus, who were shutout on home ice by the Canucks. With the Penguins in second comfortably ahead of Colorado, they’ll move up to 76. Three up on the Blue Jackets and five ahead of the suddenly hot Blueshirts, who won for the fourth straight time. The story is the consistent play of the third line. That line combined for six points on the night. Grabner scored his team-leading 26th and Miller tallied twice including the game-winner when he was in the right place at the right time with a Ryan McDonagh shot going off him past losing Nashville goalie Juuse Saros with four minutes left. Hayes only assisted on all three goals his line created. Following a Roman Josi power play goal that made things interesting, the Rangers held on for a one-goal win before delighted fans at MSG. Henrik Lundqvist got a bit of puck luck when Mike Fisher just missed on a point blank chance with the Preds pressing for the equalizer. That’s sport. It’s a game of inches. Fate was on the Rangers side. When you’re hot, you’re hot. That would explain the zone Miller is in. The third-year forward is budding into the team’s best forward. 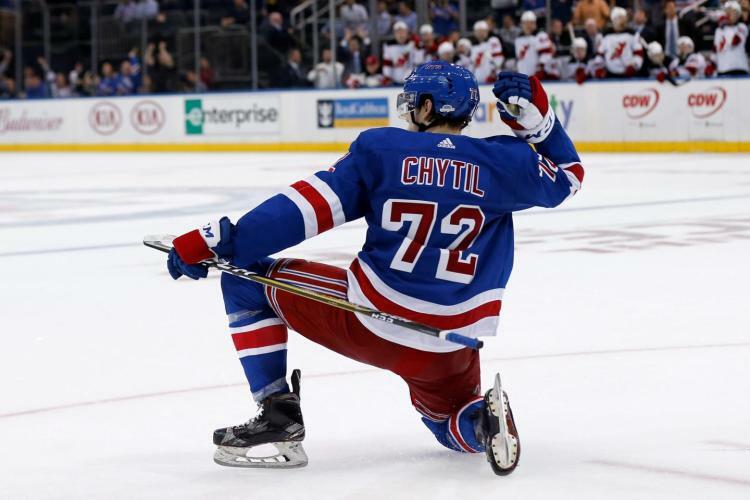 A player the coaching staff can trust to play in any situation- especially on the penalty kill where he and Hayes have formed a potent tandem that have combined for four of the Rangers’ seven shorthanded goals- Miller is playing the best hockey of his career. Only 23, the 2011 first round pick recorded his fourth consecutive two-point game. During a torrid stretch that’s seen him put up 22 points (9-13-22) over the last 17 games, seven of his 11 multi-point games have come. Prior to the hot stretch, he had been ice cold going seven straight without a point. The low point was when Vigneault demoted him to the fourth line. Ever since a successful road trip on 12/29 and New Year’s Eve in wins over Colorado and Arizona in which he posted four points, he’s been a different player. Previously, Miller was showing off his play making skills by setting up teammates with terrific passes. In the 4-1 win over Anaheim, he made two great passes for Grabner tallies. He had gone six straight without a goal but entered with eight assists. Naturally, it was Miller Time tonight as he scored twice to increase his goal total to 18 which ranks third behind Grabner (26) and Chris Kreider, who notched his 22nd in the win. His 26 assists tie him with Hayes for fourth on the team behind Stepan (27), McDonagh (29) and Mats Zuccarello (30). It is Miller who leads the club in scoring with 44 points. He’s played in all 54. A intelligent two-way player with good offensive instincts, he’s putting it all on display. As much credit as Miller gets, even more goes to Hayes, who’s turned it around following a disappointing sophomore campaign that resulted in Vigneault scratching him in a five-game first round series loss to the Penguins. In 49 games this season, a faster and slimmer Hayes is dominating shifts with improved skating and smarter puck decisions. He just returned the other night and made a difference. After missing five games with a lower body injury, Hayes has four helpers in two wins. He makes great reads to find open teammates. Most notably, his defensive play along with sidekick Miller have made them a lethal shorthanded duo. Even when they’re not scoring, they’re constantly making good reads to put pressure on opponents’ power plays. It used to be teams only had to worry about Stepan and Nash. Now, it’s Hayes and Miller who wreak havoc. Grabner is a threat any time he’s out for a penalty kill shift. It’s hard to believe he has only one shorthanded goal while ranking first in the NHL with 24 even strength goals. His game breaking speed has been a perfect fit under Vigneault, who emphasizes offense off the rush. The past two seasons, Grabner failed to hit double figures in goals with the Leafs and Islanders. In ’16-17, his 26 markers are already nine more than he had in those two years. For those keeping track, that’s 26 goals in 53 games as a Blueshirt. He totaled 17 in 114 with the Isles and Leafs previously. Signed for a bargain basement $1.65 million thru 2017, it’s become imperative for the organization to figure out a way to keep him. With Las Vegas coming in via expansion, Gorton has his work cut out for him. Obviously, it goes without saying that youngsters Hayes, Kreider and Miller aren’t going anywhere. Jimmy Vesey is in the first year of a two-year rookie deal while Pavel Buchnevich is in Year One of a rookie contract. Nash, who receives $8 million this season and $8.2 million in the final year of his contract (AAV $7.8 million), could be a likely candidate. But would you take him with one year remaining? He’ll turn 33 on June 16. Mika Zibanejad is due a raise on a current cap hit of $2.625 million that works out favorably for the Rangers. But he is getting paid $3.25 million and should command in the neighborhood of $5 million as a restricted free agent this summer. Cheaper Group II’s Jesper Fast, Oscar Lindberg and Matt Puempel may not all be back. But they’re affordable and won’t cost much. Maybe they trade one. Brandon Pirri won’t be back. That leaves Stepan and Zuccarello. Stepan is in the second year of a long-term deal that pays him $6.5 million on average per season through 2021. His no-movement clause doesn’t kick in until this summer. Would the Rangers dare consider moving him like they did Derick Brassard to free up cap space to retain Grabner and give themselves spending money possibly for a right defenseman? That’s a tough one. Stepan isn’t the best scorer but he is a solid all around player who is trusted in any situation and has proven he can perform under pressure. Don’t forget Games 5 and 7 against the Caps. He is a guy who Steps up in big moments. Zuccarello is older. He’s 29 and is signed for another two years earning a very affordable $4.5 million cap hit that expires following 2019. Interestingly, Zucc had a full no-trade in his first season. But doesn’t anymore. So, he could be available. To any diehard Rangers fan, would you trade the pint sized Norwegian with the giant sized heart? My heart says no. He’s such a valuable player and has formed amazing chemistry with Kreider, almost tutoring him. Look at Kreider this year. He’s a beast. With 22 goals and 39 points in 48 contests, he’s on pace for his first 30-goal campaign. To think they just extended him last summer at four years for $18.5 million which is a bargain basement $4.625 million. That’s why you pay for potential. As for Hayes and Miller, they’re bridged with each getting similar amounts ($2.6 million to 2.625 million) thru ’17-18. When they’re up, they’re going to command big raises. This is what makes it so tricky for Gorton. He has some tough decisions ahead. That includes whether to finally buy out old warrior Dan Girardi with still three years and $13 million left with an AAV of $5.5 million. What about Kevin Klein, who’s seen his role reduced due to inconsistencies? He only makes $2.75 million but can become unrestricted in 2018. It’s not hard to imagine a Rangers’ blue line totally revamped on the right side. With commitments to McDonagh, Marc Staal, Brady Skjei and soon to be extended Nick Holden ($1.65 million cap hit thru 2018), that leaves two spots potentially open. Will the organization have enough in the vault for say Kevin Shattenkirk if he gives them a bargain deal at say six years, $38.5 million? Is the current Blue who hits the market this summer worth it? It is hard to say. What remains is the amazing chemistry between the say Hayes kid, Grabner and Miller Time. If you aren’t enjoying the show, you’ve been missing out. This entry was posted in Column and tagged Chris Kreider, columns, expansion, J.T. Miller, Kevin Hayes, Las Vegas, Michael Grabner, Predators, Rangers, salary cap. Bookmark the permalink.